Scotch eggs are a traditional English picnic food dating back to 1738. Originally made in a department store, the intent was to provide a full meal in one tightly made ball that was easy to carry, store, and prepare on the fly. For those of you unfamiliar with a scotch egg, it is a hard-boiled egg wrapped in sausage then rolled in bread crumbs before they're either baked or deep fried. In England, these still reign as a favorite snack-time food instead of a full meal and are usually made into smaller variations. In other words, these are the popcorn chicken or popcorn shrimp variations that most Americans enjoy. 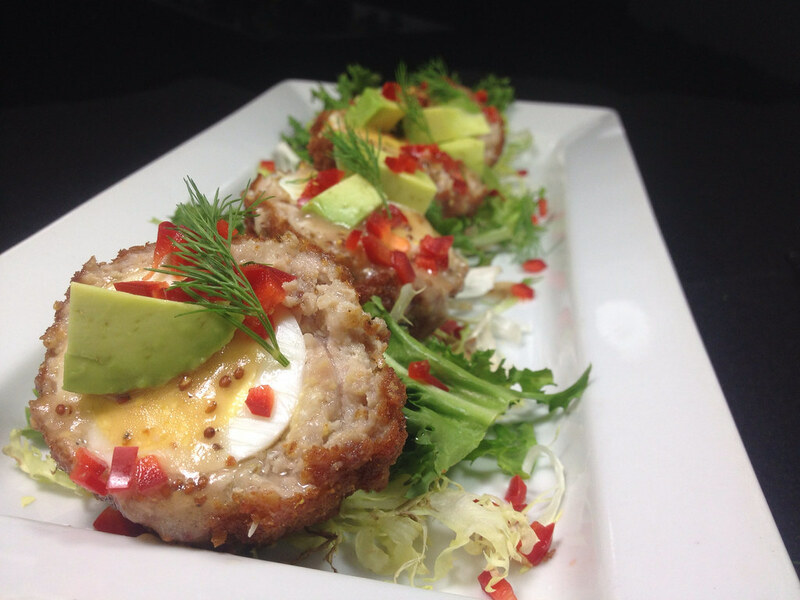 As an appetizer, the Uptown will be showcasing Scotch eggs through the coming days. But of course, we have to add a slight variation to ours to make it something unique. We start with hard boiled eggs and wrap them in housemade pork ground sausage. We then fry them until they're perfectly cooked and top them with fresh red peppers, avocado, and a sprinkling of dill. Served with a stone ground mustard sauce, they're the perfect start to any meal. Or, when you're not looking to fully commit to a large portion, they make a perfect snack. Either way you choose to enjoy them, we're positive we've done the dish proud with our new take on this old classic.